I'm working a series of Tree of Life paintings. As you may already know it's one of my favorite subjects to paint. This latest series of artwork is for an upcoming show that begins March 16th through May 11th. 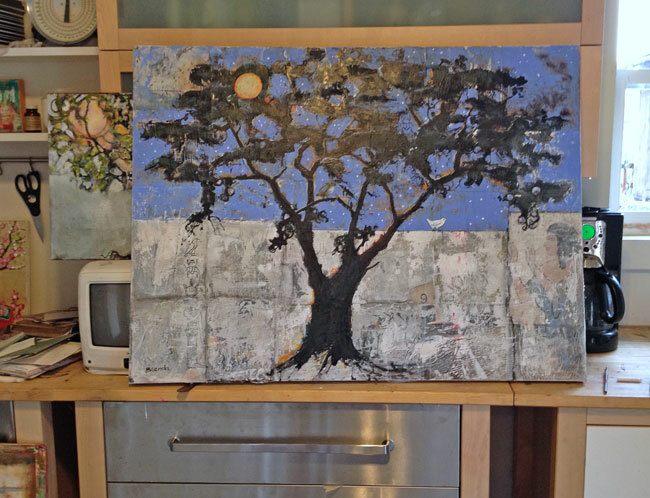 Here are a few photos of how this painting, "Ancient Egyptian Tree of Life" was created. First I collaged squares of altered paper with Ancient Egyptian themes onto the canvas. Then painted an acacia tree over this. 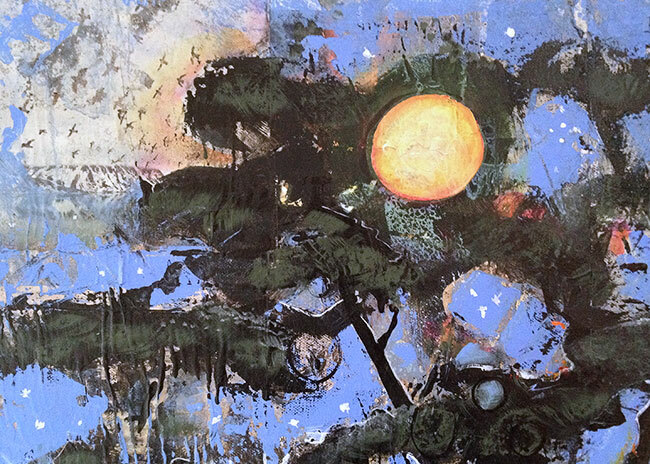 I painted a blue sky with stars and a bright orange moon. Then defined the bottom portion of the painting with layers of white gesso to make it resemble the block shape ancient ruins of an Egyptian pyramid. Detail of the lower block portion of the painting. Detail of the moon and stars with collaged paper of tiny birds flying overhead. This is the finished painting, at least for right now. If you look close you will see an owl and a scarab in the tree and a little white bird on the wall. Also a greek goddess and Ancient Egyptian symbols are peeking through layers of paint against the wall. This painting is available for sale or you can also order it as a print right here.